Surrounded by the islands of Andros, Tinos, Mykonos, Paros, Sifnos, Serifos, Kythnos and Gyaros, Syros island is located in the center of Cyclades. Distances from major ports are 83 miles from Piraeus, 62 miles from Rafina and 50 miles from Lavrio. Being 84 sq klm in size, has the eleventh place among cycladic islands but comes first in population with aproximately 20.000 people. The northern part of the island is mountainous with steep slopes, while the southern part has more even and fertile land. Capital of the island and all greek islands that belong to Cyclades is Ermoupolis, the Lady of the Aegean. 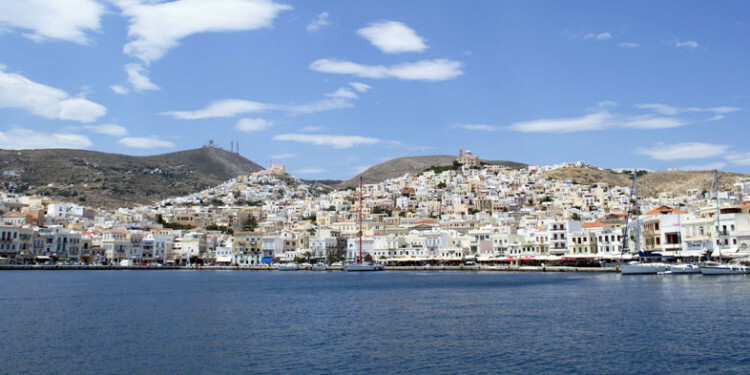 On the highest hill above the port is Ano Syros, built in the 8th Century from Venetians, with its small streets, spans and gates and the houses one next to the other with reinforced walls and no windows. Syros with its indented coastline has beautiful beaches. Vari beach is located in Vari village, one of the biggest villages in Syros 9 km away from Ermoupolis and is typical for the variety of landscapes. Azolimnos beach just outside Ermoupolis in Azolimnos village, with rapid touristic development. Megas Gyalos in the south part of the island, 12 km away from Ermoupolis. A beautiful beach with golden sand and trees that offer shadow to the tourists. Galissas, 9 km away from Ermoupolis one of the most famous of the island. A big sandy beach with trees and crystal waters. Water sports are available during the summer. Agathopes, another famous beach with golden sandy beach and shallow water. Achladi, a small beatiful beach next to Vari beach, 8 km south from Ermoupolis. Other beaches on the island are: Ampela, Armeos, Delfini, Kini, Kokina, Komito, Lotos, Santorini, Posidonia, Sousouni, Famprika, Firo Lagoni and Foinikas. 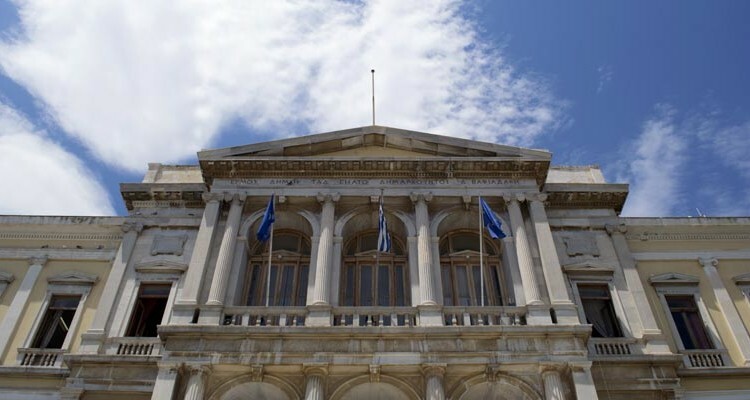 Syros island has grown financially due to tourism, the Neorion Shipyards, the agricultural production, social services being hosted in Ermoupolis and the Department of Product and Systems Design Engineering of the University of the Aegean. There are a lot of restaurants, rooms for rent, hotels, travel agencies and other travel services for all kind of tourism. Syros is famous for “loukoumi” which comes in various tastes and shapes and is its gastronomic trademark. Also Syros is well known for another local product, chalvadopita, which is a nougat-style sweet with almonds. In Syros someone can find real good honey and sessami snacks with honey, almonds and sugar. Is also famous for the well-known cheese “San Michali” with its unique taste, the aromatic “San Tzortzi” cheese and for a lot more local cheese like “kopanisti”, “graviera”, “mizithra” e.t.c.